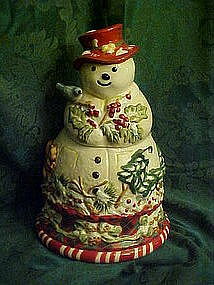 Big beautiful snowman cookie jar has all of his forest friends and holiday greenery. A pretty red bird, bluebird, and squirrel frolic amongst the holly and pine boughs and cones. Large size measuring 13 1/2" tall. Marked, Tracy. Made of pretty hand painted glazed ceramic. Pristine condition. You will cherish this cookie jar for years to come.